The long-awaited sixth film from director Paul Thomas Anderson, The Master is a movie that I’ve been meaning to get around to viewing for months, and was only able to do so only recently. Much to my pleasure, it was well worth the wait. Freddie Quell (Joaquin Phoenix) is a veteran from World War II, whose previous personal demons and mental instabilities were intensified by his time in combat, including alcoholism, sexual deviancy, and an unruly temper. 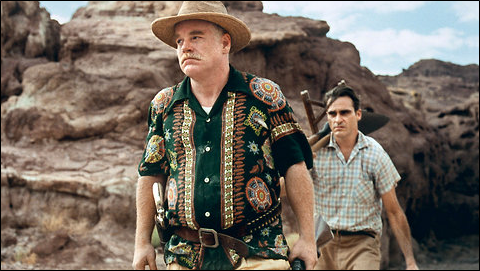 When these issues keep him from integrating into a post-war America, Quell stows away on a ship captained by the charismatic Lancaster Dodd (Phillip Seymour Hoffman), who takes Quell under his wing as he introduces him to his family, all of which adhere to Dodd’s teachings of a new cult called “The Cause”. The Cause requires of its followers to look into their past lives, cleanse themselves of faults, and analyze their self-identities to find personal peace. And so begins the engrossing relationship between student and Master. The performances in The Master are splendid, especially the chemistry between Phoenix and Hoffman, both of which give an exemplary show. Freddie is a detestable character whose behavior is a detriment to not only himself, but others. Dodd is likable and gentlemanly, but his blatant manipulation of people (however genuine the intentions of The Cause may be) is apprehensible, as is his own personal temper when confronted over his beliefs. This is something that is not aided by the encouragement of his equally dedicated, but much colder wife, Peggy (Amy Adams). Both of these engaging characters are played well, and their destructive, yet almost obsessive relationship between one another is engrossing. On a technical level, the film is also a marvel. The camerawork is good, the direction is great, and the music is perfectly unnerving. The standout is the pacing – slow and deliberate, and eerily calm. Even when the characters’ passions reach a boil, the movie never flows over – it always keeps its cool. The cult that Dodd leads, The Cause, is obviously similar to the Church of Scientology, but save for evident similarities, nothing more is made of it. Save for a single scene, the movie doesn’t criticize the cultic lifestyle or teachings, or comment much on it save for using it as a device in which to service a character study. The codependency between these obviously broken people – from Quell, to Dodd, to Peggy, to others – is truly an interesting sight, and one that I feel I failed to truly comprehend or grasp the entirety of in a single viewing. Like the seemingly possessed pupils to The Cause, I can see myself returning to The Master in future attempts to comprehend all of its lessons. Just saw this film. Very well written review. Thank you. I hope you enjoyed it as much as I did.